When I read the story in the link below I was quite disturbed. Not disturbed because there was a bear in a residential area - having lived here for eleven years and five years in northwestern Ontario just prior to moving here I am quite accustomed to bears - but disturbed because of what happened after someone discovered a bear in a tree in their yard. You see what happened is the resident, seeing the bear and apparently fearing the worst, took out a firearm - and shot into the tree, killing the bear. In my estimation there are two separate issues going on here, so let's tackle them as such. First, we have the discharge of a firearm within city limits in a residential neighbourhood. As most residents know (or should know) this is quite definitely illegal. Guns and residential neighbourhoods don't mix well. There are buildings, and cars you could hit accidentally - and, well, residents. I realize that some people are excellent shots and can aim very accurately. What worries me about this recent incident is that it could set a precedent. See a bear in your yard, shoot the bear, then call Fish and Wildlife...but what if the shooter has poor aim and instead shoots something else? Like a house or car or, god forbid, a person? What if the bullet is deflected and goes off trajectory? Can you imagine the legal and moral ramifications in that situation? You, as the one holding the gun, are subject to charges, possibly even manslaughter charges. You could spend time in jail, and you could very easily be sued in civil court. It seems to me this is an unwise risk to take unless the bear in question is posing a very real, imminent, and immediate danger to human life. And in this case, a bear in a tree, does not appear to be posing such a danger. Given that the bear found a way into the yard one can assume it would likely be able to exit the yard the same way - or find another way out. I have seen bears climb fences, so it is not like they are incapable of doing so (or a large enough bear can just knock it down). The reality is that we have hired Fish and Wildlife officers to deal with these situations. They are not only trained professionals but they also then take on the responsibility should such a situation like this go wrong and anyone is injured. Residents do not have the moral or legal authority to shoot wildlife they find within city limits, and certainly not wildlife that is currently sitting in a tree and could choose to amble away in the same way it came. I do not accept the reasons given as valid, especially since a quick call to Fish and Wildlife could have had officers on the scene and if necessary they could tranquilize the bear and remove it. How do I know? Because I have called them about bears, that's how, and I will relate that story below. First, however, let's look at the second issue this incident raises. We live in northern Alberta. This is an area that is threaded through with wildlife corridors. We have been building on their habitat for decades, but now some of our neighbourhoods are cutting even deeper into them. As such we are going to have close encounters with local wildlife, and that is simply reality. The question is how exactly are we going to develop this relationship? Are we going to recognize that we have encroached on their habitats and that we must exercise our responsibility as stewards to try to ensure they can continue to live their lives just as we live ours? Are we going to have them moved if they become too familiar, and, as a very last resort, euthanize them if they exhibit behaviour that is dangerous to human life? Or are we simply going to shoot them? I rather hope that we, the ones with the guns and the big brains, will use the big brains wisely and put our guns away until there is a very clear and immediate danger. We are increasingly growing into a very urban environment, and while we enjoy that urban lifestyle we also have the challenges of dealing with wildlife because of our location in the north. As such we need to figure out that relationship with our local wildlife, and we need to do it quickly. Now, about that bear story. The photos above are mine, taken a few years ago when I too lived in Abasand. 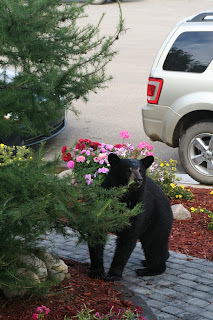 One day my then nine-year old daughter went out on to our verandah where she quickly spotted the bear above, right in our front yard - and about twenty feet away from her. She came tearing into the house screaming as she came, so guess what I did? Well, I didn't pull out a gun and shoot the bear, who was pretty much right outside my front door. I made sure everyone including the family dog was inside and then I set off my car alarm to try to scare the bear away and warn my neighbours that something was going on outside so they didn't just walk out into the street and be as surprised as my kid. Then I snapped a couple of photos while the bear decided the noise was too much and wandered back into the forest (we were, incidentally, also right on the greenbelt and right on a well travelled wildlife corridor). 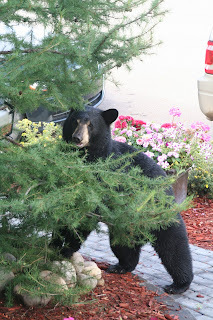 And then I called Fish and Wildlife who came out to say that they would set up a bear trap, but that the bear was very likely to move on if everyone removed their bird feeders and kept their garbage inside. And you know what? It worked. The bear was never trapped, but he did move on after all the neighbours decided to work together to make sure there were no goodies left outside to entice him back - no bird seed, no peanuts, no dog food, no garbage. The bear went on to live his life, and the neighbourhood went on to live ours, and no one got shot. The reason I selected the title for this post is very simple. The gun we have, the one where we make the decisions that impact wildlife like bears and can end their lives, is always loaded. But it is not, in an urban setting, in our hands, and nor should it be. I think it is a dangerous precedent to set if we allow or encourage residents to shoot wildlife unless said wildlife is presenting a very clear and real threat to human life. While this incident on the weekend ended okay (except for the bear, of course, for whom things just ended) some day there will be someone who is a poor shot or a bullet will be deflected and then where will we be? We cannot set a precedent that allows or encourages this sort of behaviour because the risk to human life from an inadvertent stray bullet is probably a far stronger risk than ever being attacked by a bear (in fact if you compare accidental shooting stats to black bear attack stats I suspect you'd find we stack up very poorly). The loaded gun, and the decision to shoot a bear or to tranquilize it or to simply wait it out, rightly belongs with the people we pay to deal with the situation, which is Fish and Wildlife. Just remember that when you put that loaded gun in your hands then you get all the responsibility that follows - and in that case I am very glad that gun is not in my hands. Agreed. I cannot possibly agree more. I am writing to the fish and wildlife department to express these concerns, and I encourage everyone else to do the same. Great Article. One other thing to note is that it would have taken less time to call 911 or fish and wilflife than to get out a gun from one locked location and the bullets from another locked location. The higher brain power we have would suggest that this individual had plenty of time to make an informed decision. If the bear was attacking then you can make a "fight" decision. Understandable perhaps in a rural environment but in this situation not very smart.